The weather has been erratic lately with temperatures ranging into the mid 30s. At the rate of goes, it wont be long before we become feverish just by walking into the sun. So I thought I would make this delicious chinese yam soup to counter the heatwave. Even if it doesn’t, it is still a good bowl of nutritious soup for the family. The best part about this soup is the fact that it doesn’t need too many other condiments to make it great. 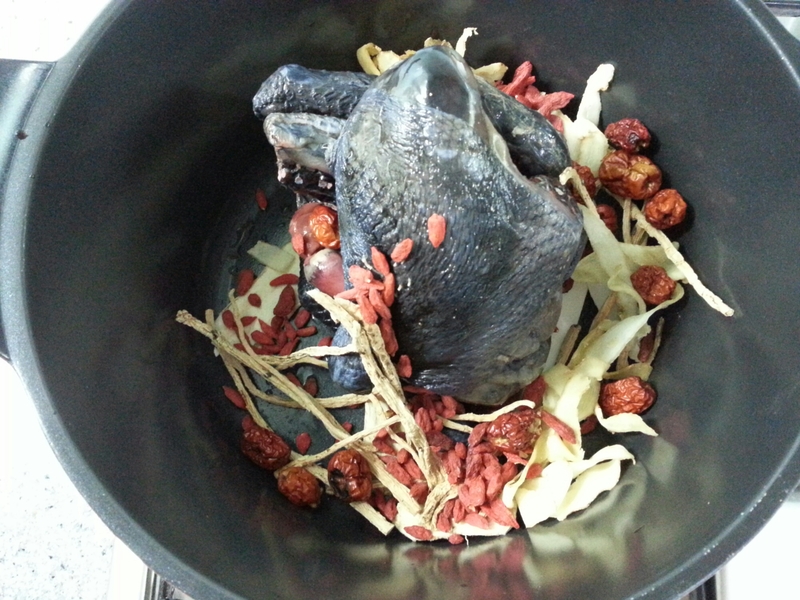 A half a black chicken and a slender tube of huai shan is sufficient to make a great tasting soup. Add a tablespoon of wolfberries and the soup takes on a character of its own. The best part is, it is so easy to make, even if the ingredients are frozen (see picture). 1. Boil a kettle of water. 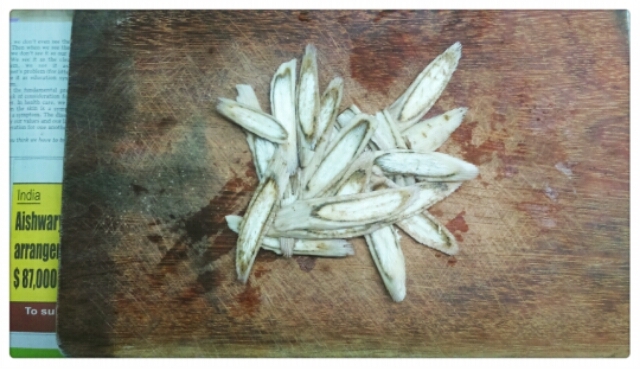 While waiting for the water to boil, you can peel and wash the Huai Shan and cut them into 2 inch pieces. The yam tends to break into pieces if you boil for too long. I use a thermal cooker, so it works just right. The yam is intact and doesnt disintegrate. 2. 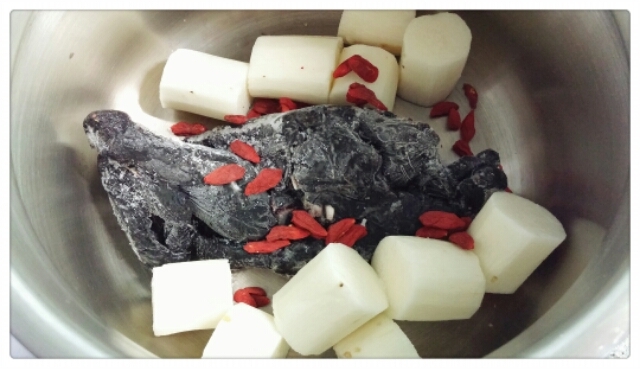 Place the frozen black chicken into the pot. The water should be boiling by now. 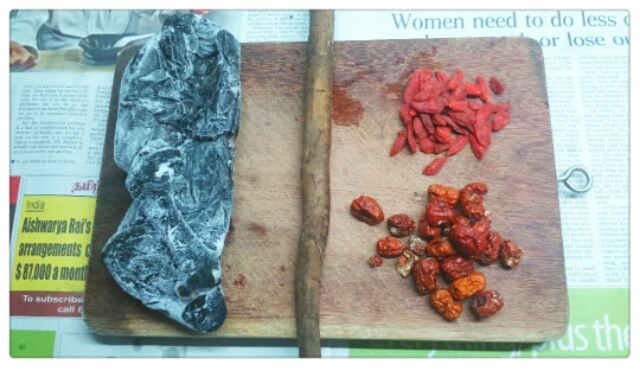 Add the Huai Shan into the pot and the tablespoon of Wolfberries and then pour the hot water into the pot. Add a little salt and then turn on a big fire and boil the soup for 15 minutes. 3. Once the soup is boiled. Place the pot into the thermal cooker and let it slow cook till you come back in the evening 12 hours later. The soup should be delicious and the chicken tender and huai shan firm and softened. I have always wanted to make this soup and I can already imagine how delicious this soup would taste like even before cooking. The burdock soup with pork ribs was already delicious so with the addition of the black chicken, needless to say, this soup is gonna rock and roll. The recipe is very much like the Burdock Soup 牛蒡汤 that I made recently, but except that now the recipe is complete. No more reliance on pre-packed herbal remedies. I have found the perfect confluence of ingredients for this soup. Every ingredient brings to the table a slew of medicinal benefits. Otherwise it really makes for a great tasting soup. Try it! 1. Boil a kettle of water. Clean and peel off bark of Burdock Root. Then slice thinly (see picture below). You may soak it in hot water for 10 minutes if you like. Otherwise if you prefer a stronger earthy taste, then just drop it into the pot. 2. Place the half a chicken into the pot. As you can see my black chicken is frozen. My intention is always to simplify the process. So frozen black chicken is fine, no need to thaw. Just drop it into the pot. Add Wolfberries, add dried red dates and a pinch of salt. Then add the hot boiling water and boil at high heat (with lid on) for 20 minutes. 3. Place it in thermal cooker after that for 12 hours (which is when I get home) and the soup would be delicious. Black chicken tender. Soup rich with flavour. My wife and I love ginseng flavored black chicken soup, especially the one bought by my dad from this stall at Jalan Bersih Hawker Centre. They also sell the best turtle soup I believe in Singapore. 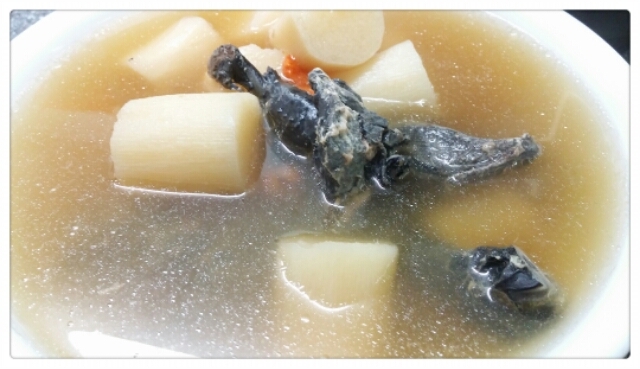 Black chicken soup is also very nutritious and good for new mothers during confinement month. It is generally regarded as a delicacy. Very easy to cook and best if you double-boil it. Of course double boiling just means that it will take a while longer. I usually buy the black chicken fresh from the chicken butcher at the wet market. He will help chop the chicken into pieces really fast and neatly. I usually get him to chop into four pieces but you get him to chop into six parts. The herbal mix of ginseng and other berries and roots I usually get the pre-packed ones from NTUC supermarkets. The items there are sufficient for what I need to do and it is fairly fuss free. Alternatively you can also buy the herbs from shops like Hock Hua as they would carry the entire range or grades of herbs. Preparation time for this soup took just 30 minutes to prepare but if you have more time it would be good to simmer the chicken till the meat falls off the bones. Try it. 1. Place the chopped chicken in a large pot. Add the herbs into the pot. Add a litre of water. Add quarter teaspoon of salt. Boil high heat until the flavor of the chicken and the herbs comes through. 2. Then turn down the heat and slow cook till the meat is just tender. I am also starting OTS aka “one take sessions” on anything that might be remotely useful for people that stumble upon this blog. Also, it is more for me because I really really want to know how to chop chickens properly. I got to admit it, I am bad at chopping chickens. I don’t know where to pull or where to chop. Sometimes the simplest of cuts can become a massacre of epic proportions. I wish I have the wisdom of the chicken butcher when it comes to cuts and then a brilliant idea popped into my mind. Ask the chicken butcher at the market to do a demonstration. It’s not the most exciting of videos, but it’s a great “how-to” video. A fantastic OTS. Enjoy.